These large stout sharks are found in both salt and fresh water. They have been recorded in rivers hundreds of miles from the sea but are most commonly found in marine, estuarine environments close to shore (Simpfendorfer and Burgess 2009). Bull sharks can grow to a total length of about 340 cm. Like most of the requiem sharks in the genus Carcharhinus, Bull sharks are plain grey above, with a pale to white underbelly. They have broad, rounded snouts and small eyes (Compagno et al. 2005). They are opportunistic feeders targeting bony fishes, sharks, turtles, birds, dolphins and terrestrial mammals. Fun Fact: Bull sharks were blamed for a series of attacks in 1916, which served inspiration for Peter Benchley’s book Jaws, which Steven Spielberg turned into a blockbuster movie in 1975. The bull shark name derives from its stout appearance and reputation for aggressive behavior. 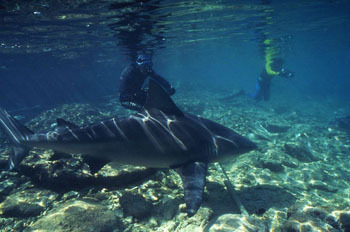 It is known by many different common names throughout its range including requin bouledogue in French speaking countries; Tiburon sarda in Spain; Zambezi shark, Van Rooyen’s shark in South Africa; The Ganges shark in India (though this name is also given to the freshwater river shark Glyphis gangeticus); The Nicaragua shark in Central America; The freshwater whaler, estuary whaler, and Swan River whaler in Australia; The shovelnose shark, square-nose shark, river shark, slipway grey shark, ground shark, and cub shark in various English speaking parts of the world. Though the bull shark is not a targeted species in most commercial fisheries, it is regularly captured on bottom longline gear. In the commercial shark fishery in the southeastern U.S., in the 1990’s, the Bull shark comprised 1-6% of the large coastal shark catch. (Branstetter and Burgess 1997). It is more often targeted in small artisanal fisheries because of its abundance in nearshore environments. The meat is either used for fish meal or sold in local markets for human consumption. The fins are used in Asia for shark fin soup while the skin is frequently used for leather (Simfendorder and Burgess 2009). The bull shark is considered a game fish in the southeastern U.S. and South Africa, and is fished by rod and reel from shore, piers, and bridges. According to the International Game Fish Association (IGFA), the largest bull shark caught on rod and reel weighed 771 lb. 9 oz. (347 kg) and was caught near Cairns, Australia. 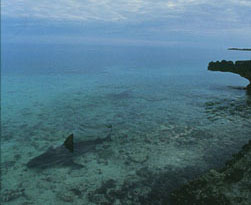 Bull sharks are frequently observed at recreational shark feeding dives in the Caribbean. According to the International Shark Attack File (ISAF), bull sharks are historically responsible for at least 100 unprovoked attacks on humans around the world, 27 of which have been fatal. However, it is likely that this species may responsible for many more. It is considered by many to be the most dangerous shark in the world. It’s large size, proclivity for freshwater, abundance and proximity to human populations, particularly in the tropics, makes it more of a potential threat than is either the White shark or the Tiger shark. 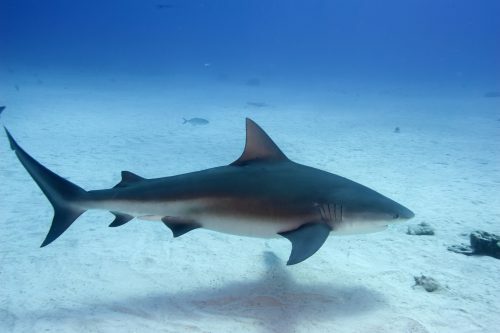 Since the bull shark occurs in several underdeveloped regions of the world including Central America, Mexico, India, East and West Africa, the Middle East, Southeast Asia, and the South Pacific, bites often go unreported. The Bull shark is also not as readily identified as is the white shark or the tiger shark, and so may be responsible for a large fraction of the of the attacks that go unassigned to species (ISAF 2018). The bull shark is considered the likely culprit for the infamous series of five attacks that occurred in New Jersey in 1916 that resulted in four fatalities over a 12 day period. 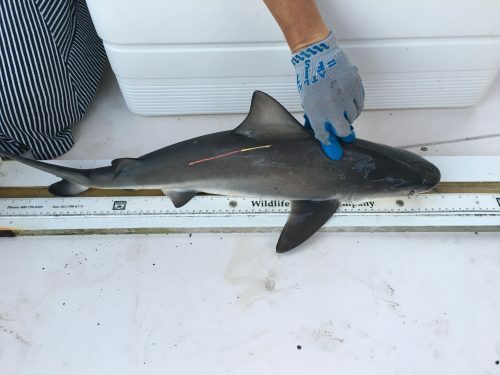 Three of these attacks occurred in Matawan Creek, a shallow tidal river, only 40 feet (12 m) across, 1.5 miles (2.4 km) from bay waters, and over 15 miles (24 km) from the open ocean; not a location where any other large shark species would likely occur. A 7.5 foot (2.25 m) white shark was captured two days after the last attack, 4 miles (6.4 km) from the mouth of Matawan Creek, and allegedly contained human remains in its stomach. A 9 foot (2.7 m) bull shark was also captured a day later only 10 miles (16 km) from Matawan. This has been a topic of controversy for many years, and there is evidence that points to the involvement of both the bull shark and the white shark. It has not yet been conclusively resolved. (ISAF 2018). 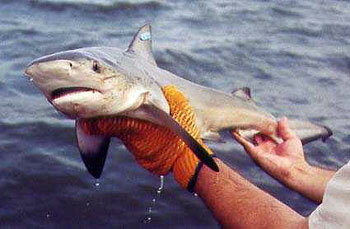 Though the Bull shark is not a targeted species, it is routinely caught in fisheries around the world. Because it lives in estuarine and inshore regions, close to human populations, it is vulnerable to human impact. The inshore nursery grounds are particularly at risk. The Natal Sharks Board reports that the average size of bull sharks caught in their beach nets have significantly declined in recent years, which does not bode well for South African populations of the species. The bull shark is not currently legally protected in any part of its range. Further research is necessary to better characterize its biological, ecological, and fisheries significance (Simpfendorfer and Burgess 2009). > Check the status of the bull shark at the IUCN website. Bull sharks occur in tropical to subtropical coastal waters, worldwide. 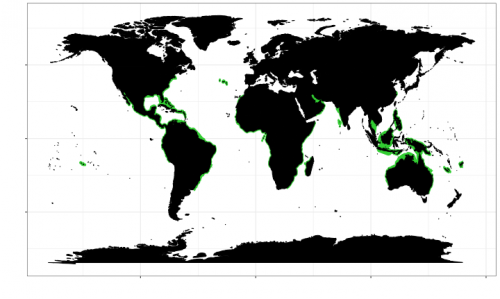 They also occur in a number of river systems and some freshwater lakes (Compagno et al. 2005). They have been reported 3700 km (2220 mi) up the Amazon River in Peru, and over 3000 km (1800 mi) up the Mississippi River, in Illinois. A population in Lake Nicaragua (Central America) was once thought to be landlocked, but it was subsequently determined that they gain access to the ocean through a system of rivers and estuaries. In the western Atlantic, bull sharks migrate north along the coast of the U.S. during summer, swimming as far north as Massachusetts, and then return to tropical climates when the coastal waters cool (Simpfendorfer and Burgess 2009). The bull shark prefers to live in shallow coastal waters less than 100 feet deep (30 m), but ranges from 3-450 feet deep (1-150 m). It commonly enters estuaries, bays, harbors, lagoons, and river mouths. It is one of very few species that readily move into freshwater, and apparently can spend long periods of time in such environments (Sharks of the Genus Glyphis are also capable of living in freshwater). There is evidence that while they can breed in freshwater, they do not do so as regularly as they do in estuarine and marine habitats. Juvenile bull sharks enter low salinity estuaries and lagoons as readily as adults do and use these shallow areas as nursery grounds. Bull sharks can also tolerate hypersaline water as high as 53 parts per thousand (Simpfendorfer and Burgess 2009). Bull sharks are very stout-bodied and have a blunt, rounded snout. They lack an interdorsal ridge. The first dorsal fin is large and broadly triangular with a pointed apex. The second dorsal fin is significantly smaller. The pectoral fins are also large, broad and angular. Bull sharks have small eyes relative to most other carcharhinid sharks which suggests that vision may not be as important for this species which often occurs in turbid waters. Bull sharks are pale to dark gray above, fading to a pale cream color on their underside. In younger individuals the fins have dark tips which fade to a more diffuse dusky color as they grow. 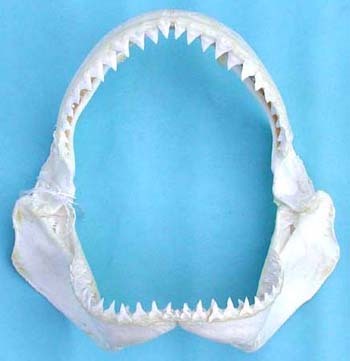 Upper jaw teeth of the bull shark are broad, triangular, and heavily serrated. Lower jaw teeth have a broad base, and are narrow and triangular with fine serrations. Anterior teeth are erect and nearly symmetrical, while posterior teeth become more oblique in shape. The maximum reported length of the bull shark is 400 cm (~13 ft) (Compagno et al. 1995) and maximum reported weight is 316.5 kg (~698 pounds) (IGFA 2001). Size at birth is 56-81 cm (~2-3 ft) and size at maturity is 157-226 cm (~5-7 ft) for males and 180-230 cm (~6-7.5 ft) for females (Simpfendorfer and Burgess 2009). Age of maturity is between 15-20 years and the known lifespan is >25 years (Compagno et al. 2005). Growth rates have been calculated by Thorson and Lacy (1982) using tag recapture information in Lake Nicaragua. They estimated that in the first two years, the growth rate is about 16-18cm per year. A later study by Branstetter and Stiles (1987) estimate that this growth rate subsequently slows to 4-5 cm per year. Bony fishes and small sharks make up the vast majority of the bull shark’s diet. In the western Atlantic they commonly feed on mullet, tarpon, catfishes, menhaden, gar, snook, jacks, mackerel, snappers, and other schooling fish. They also consume stingrays and juvenile sharks including small individuals of their own species in their inshore nursery habitats. Other food items occasionally reported in bull sharks include sea turtles, dolphins, crabs, shrimp, sea birds, squid, and dogs. Bull sharks appear sluggish as they cruise slowly along the bottom, but are capable of quick bursts that allow them to capture smaller, agile prey. They have been recorded to move at over 11 mph (19 km/h) over short distances. Age of maturation for female bull sharks is estimated to be 18 years (6-7.5 feet (180-230 cm) total length, TL) and 14-15 years (5.1-7.41 feet (157-226 cm) TL) for males (Branstetter and Stiles 1987). Bull sharks bear live young. The developing pups (one to thirteen per litter) are nourished internally via a yolk-sac placenta. The mother gives birth after a 10-11 month gestation period at which point they become free-swimming and autonomous. In the Gulf of Mexico mating occurs during summer months, and the pups are born the following April-June. Mating and birthing occurs year-round in the warmest parts of the range. Females often bear mating scars on their flanks. Coastal lagoons, river mouths, and other low-salinity estuaries are common nursery habitats (Simpfendorfer and Burgess 2009). Adult bull sharks have few natural predators. Young bull sharks, however, can fall prey to tiger sharks (Galeocerdo cuvier), sandbar sharks (Carcharhinus plumbeus), and other Bull sharks. A crocodile in South Africa was also reported to have consumed a bull shark. Parasites of the bull shark include the copepods Pandarus sinuatus and Perissopus dentatus. They can be found attached to the body surface, often in the axil region of the pectoral and pelvic fins. The bull shark was first described by Valenciennes in Muller & Henle (1839) as Carcharias (Prionodon) leucas, and later changed to the currently valid name Carcharhinus leucas. The genus name Carcharhinus is derived from the Greek “karcharos” = sharpen and “rhinos” = nose. It has also appeared in the literature as Carcharias (Prionodon) zambezensis,Carcharhinus zambezensis, Prionodon platyodon, Squalus platyodon, Squalus obtusus, Eulamia nicaraguensis, Carcharias azureus, Carcharias spenceri, Galeolamna (Bogimba) bogimba, Galeolamna greyi mckaili, and Carcharhinus vanrooyeni. Simpfendorfer, C. & Burgess, G.H. 2009. Carcharhinus leucas. The IUCN Red List of Threatened Species 2009: e.T39372A10187195. http://dx.doi.org/10.2305/IUCN.UK.2009-2.RLTS.T39372A10187195.en.